For people who have not actually watched Gundam 00, this post may show you things you have not seen before. Really, I wanted to resume showing the background of the Gundam 00 Movie, not so much in terms of plot, which you could skip 98% of and still grasp the movie, but in terms of mecha, which are the real reason to watch a mecha show. I know, I know, it’s supposed to be human drama, but when you make machines that have humanoid characteristics, they become de facto characters as well. Let’s not deny that they’re a big part of the attraction. 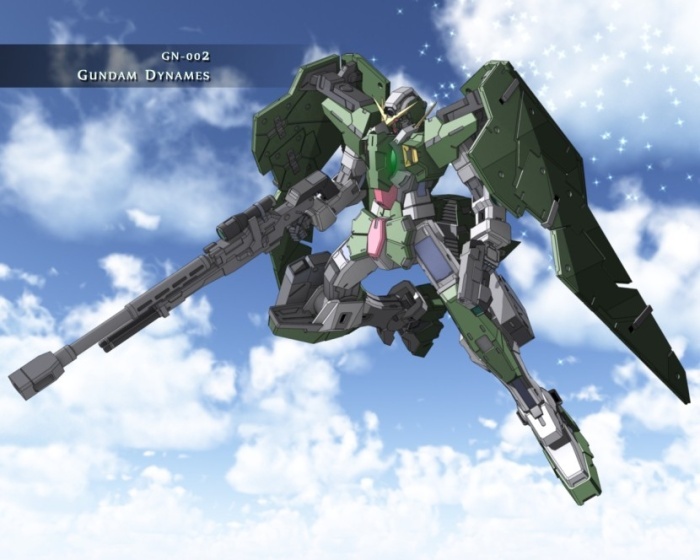 All Gundams in Gundam 00 are based around a super-particle that the series calls GN Particles, with no actual breakdown of what “GN” stands for. Keep this in mind when reading the rest of this article. The Gundams of the “protagonist” organization Celestial Being use what are known as “solar furnaces” for engines, miraculous even for the futuristic setting, being nearly perpetual energy machines. These GN Drives have effectively unlimited operating time, but are limited in how much energy they can generate at any one moment. This provides the foundation for the Gundams’ astonishing abilities and weaponry. As the first headline suggests, Dynames was designed for sniping. However, this is not quite its only function; it serves as a highly mobile sniper/ sharpshooter. The combination of relatively high agility and great accuracy and power in its ranged weapons creates the need for what passes for a co-pilot. This cute looking talking robot was originally part of the first Mobile Suit Gundam as a hand-built toy created by the main character, a teenager with high mechanical aptitude. (As with many old mecha anime (and despite the show’s overall introduction of a highly “realistic” style), the main character was the son of the lead designer of the Gundam itself.) In later incarnations of the franchise, Haro units appeared at various times as well. 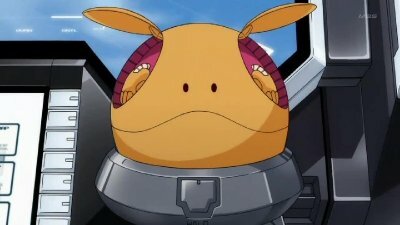 Only in one previous anime, Gundam V (“Victory”), did a fully intelligent AI-based Haro serve as a co-pilot for an early teen main character. Here, the pilot is the decidedly young adult Lockon Stratos (a codename). With this setup, Haro acts as the co-pilot, but in reality, handles virtually everything except actual shooting. This includes evasive action, sensor search, emergency SOS, and so on and so forth. Although not favored by the design concept, this suit is equipped with two GN Beam Sabers (originally explained here) for last-ditch melee defense. As the chosen pilot is not a close combat specialist by any stretch, even pistols (see below) are preferred to this unless truly desperate. Dynames is equipped with a pair of GN Pistols, firing high velocity GN particles with great rate of fire and accuracy. Lockon and Haro combine to create a combat style of high speed evasion combined with pinpoint shots at close range, though things like strafing can be done to hold the enemy at a distance. The front skirt armor and both knees contain launchers for GN Missiles, which are ideally used against large targets or groups of enemies. Thus, Dynames has a means of delivering heavy firepower that the Exia cannot match, as one example. This is the main weapon of Gundam Dynames. 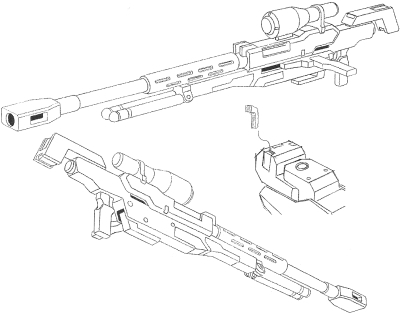 To put it briefly, the GN Sniper Rifle is a high energy, long range, extremely accurate sniper rifle. However, the GN Drive used by Dynames provides so much energy that the sniper rifle can be fired multiple times in close succession. This makes Dynames more resistant to “rushing” tactics. Given time to shoot, the power and accuracy of this rifle is more than sufficient to annihilate whole squads in short order. In addition, the energy blasts are so rich with particles that atmospheric dissipation of energy beams is less of a factor, resulting in much longer effective range than most blasts would have. 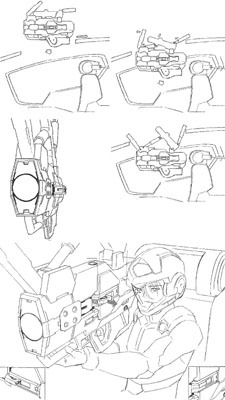 The rifle can be stabilized by a bipod, taking advantage of the mobile suit’s humanoid design, but is usually attached to a rotatable right shoulder dock (which allows Dynames to switch to other weapons without losing the rifle). An optional scope may be attached above the barrel, in addition to the head’s custom external optics to further enhance reliability in targeting. Who could multitask with this? That's why there's Haro. 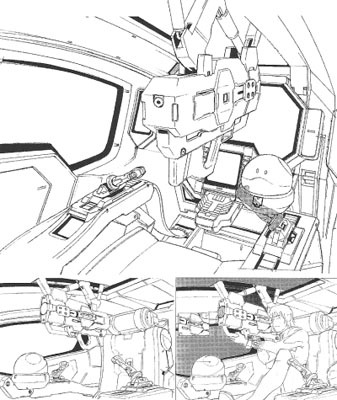 A custom control system within the cockpit is used to make firing the rifle as similar to firing a “real” rifle as possible, allowing a human’s acquired sharpshooting skills to be fully translated through the suit to the final shot. This is a special weapon system, essentially a SuperSized GM Sniper Rifle with obscene weight and bulk, that is meant for one task: sniping orbital targets from the surface of the Earth. This, combined with holographic camouflage that hides the suit before the critical moment, allows Dynames to receive an order, equip the weapon, aim, and blast a satellite from the ground. Aside from that single purpose, it is not very practical, but it is powerful. It’s the sort of idea that gets put into a show just because it’s cool. In the hands of a born sniper with well-honed skills, this would be an incredibly deadly weapon of battle. Given that exactly such a person did pilot it, this was an incredibly effective tactical weapon. Of course, it lacked any truly special defensive system – something addressed in a later version – and always retained a vulnerability in melee combat, but only a select few pilots (with the right machine) would be capable of exploiting this weakness. Being specialized is not a bad thing. Used properly and wisely, this high performance machine played its role very, very well indeed. Stuck in the wrong tactical situation, it would not fare well at all. This entry was posted in Anime, Japanese, Movies, video games and tagged anime, Dynames, Gundam, Gundam 00, Japan, mecha. Bookmark the permalink.